Secretary's Day is tomorrow, in case anyone needs to pick up a gift. This is the first year my husband has an assistant. His workplace tradition is a catered lunch and early dismissal on Friday, but everyone still gives a little something personal. We budgeted $10. I picked up a dozen roses at Fresh Market ($6.99) along with one of their ultimate pecan cinnamon rolls ($1.09). With the remaining change I bought a six-pack of Diet Cokes for her office fridge. (She always teases my husband about drinking "faux cokes," i.e. the Kroger version.) Then I felt sorry for my husband who will have to eye that cinnamon roll on the way to work. After all, I almost couldn't stop myself from eating it on the way home! 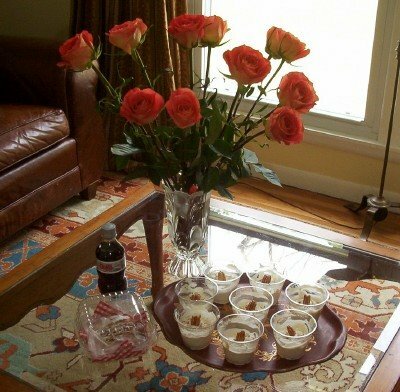 Just for him, I made another batch of the South Beach ricotta cremes using chopped pecans, extra cinnamon and Stevia instead of Splenda. Not bad! The only thing I have left to do is to rearrange the roses with ivy in a vase that will fit in the car's cupholder. Let's just say I have learned this method of flower transport the hard way! $10 seems a bit high for your typical gift giving? How thoughtful! If I was an assistant, I would appreciate this very much. Good job! She will really appreciate the thought and care you put into this! Great minds think alike! My husband has to give to 4 secretaries. He got nice vases for just over $1 each at Michaels, and very nice bouquets from a local grocery for $3 each. It was a little pricey, because there are four of them, but those women are worth gold to my husband, and to me! We also bought baskets of lotion, soap, etc. on clearance after Christmas. They were $25 each, marked down to $7. Those are "in reserve" gifts for my husband's work. If nothing else, we'll use them as gifts for next Christmas. Vicki, he did well for $4 a person! We wanted to do something extra nice for my husband's assistant because she is truly the best one in the whole school and she's been dealing with the stroke and impending death of her mother during the past two weeks. : ( She is so thoughtful, you all would just love her. Of course the fact that she's in her fifties and is a dead ringer for my MIL makes me a lot more secure with my husband having such a sweet assistant! anonymous, From the small experience I have, $10 is not all that high at all. Merchant Ships has done a great deal on a small budget. Of course, I am somewhat suspicious at the place I work the people may expense the assistant day gifts they get, so the company ends up paying for it, not the individual. Packages of fancy chocolates and potted plants are not at all unusual. We've never been let go early though. Wow. Our department BOSS came through and passed out gift certificates this year! Last year, it was just the leads doing it. I barely see the boss at all (He's the head over all 250 or so people (and growing) at this location). And he knew my name!